Southern California gardeners are busy harvesting summer vegetables in August, but it's also the time to start planning for a fall garden. Pick Your Summer Vegetables: Even if you don't have a green thumb, by giving only scant attention (but plenty of water) to zucchini, squash and tomato plants you will be rewarded with an almost continuous supply of vegetables during August. Make sure you pick vegetables regularly to stimulate more growth so the plants continue to produce through the fall. Plant Your Fall and Winter Vegetables: It's too late to plant summer crops, but it is time to plant seeds or starter plants that produce cool-season vegetables such as green onions, carrots, broccoli, cabbage, cauliflower, mustard, radishes and beets. The seeds and young plants will benefit from August's warm soil. If planting seeds in flats, put the flats in partial shade to avoid the direct August heat. Transplant the seedlings into the garden when they are about 4 inches tall. Water Smart: Even drought tolerant and native plants need plenty of water in the heat of summer. Give them a good soak at least twice a week. Potted plants are especially susceptible to the ravages of heat. If they still wilt after daily watering, consider moving the pots to shade or partial shade locations until the weather cools. Water in the early morning hours to reduce evaporation and water longer so the water has a chance to travel deeper into the soil. 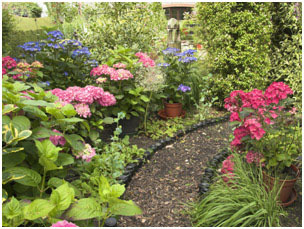 Cover your soil with a layer of mulch to better hold in moisture. Prune Roses: Remove droopy flowers and hips. Prune roses only lightly--enough to stimulate new flower growth into the fall. Water regularly. Get Ready to Harvest Onions: Home grown onions have a stronger flavor than the onions you'll find at the store. A rule of thumb is to stop watering bulb onions when the foliage begins to dry. When most of the foliage has wilted and fallen over, bend the rest down to the ground and wait another two weeks before harvesting. Once harvested, let them sit in the sun for a day. Spread them out in a dry, non-sunny location for two more weeks. This will ensure that the outer layers are free from moisture and prevent black fungus from growing on the onions. Protect Fruit From Predators: Put bird netting on fruit trees two or three weeks before the fruit begins to ripen. This will keep birds from feasting on the tree fruit. Use rocks or bricks to hold down the netting so birds, rabbits or squirrels can't accidently get trapped inside. Plant For Color and Fragrance: August is a good time to plant bushes and trees that add color and fragrance to your garden just about year round. For a dash of color, consider begonia, impatiens, oleander, Chinese hibiscus and firebush. For fragrance, plant gardenias, jasmine and lilac.